1993 is, I'm sure, notable for many things. But for some, it was most notable as the year of the second straight "Fab Five" appearance in the NCAA National Championship game. The year before, Jalen Rose, Juwan Howard, Jimmy King, Ray Jackson, and Chris Webber had become famous for being an all-freshman starting five at the University of Michigan, introducing what has been referred to as "a hip-hop element" into the game, and getting all the way to the championship game before losing to Duke. The next year, as sophomores, the Fab Five was even better. Again, they went all the way to the championship, this time against North Carolina. And then, the timeout happened. 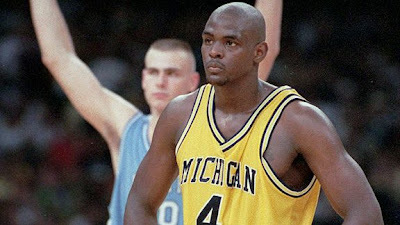 Very late in a close game, Chris Webber (the team's best player and the man who would be drafted first overall in the upcoming NBA draft) called a timeout when his team didn't have one. Such a mistake results in a technical foul, giving the opposing team two free throws and the ball. Michigan couldn't recover, and lost. Webber was ruthlessly mocked, both at the time and for years to come. A perennial All-Star, "Chris Webber timeout" is still the first Google suggestion when you type in his name. Chris Webber did have a great future, and though I suspect he's never totally gotten over that moment in 1993, this letter must have been, and likely continues to be, an incredible balm for the wound. Such is the inevitable operation of grace in the face of the world's judgment.